Laurent Saillard is beginning to make his own wines under his own labels, and he turns a new page in his new life as a winegrower, having found recently a cellar to rent to store his own facility. To rewind a few years earlier, Laurent had discovered a new life in the Loire after years working as a chef in New York and co-managing Ici in Brooklyn with his former wife. His restaurant was already a venue where the farmers' market produces (he was proven visitor of Brooklyn's farmers' markets) paired well with the natural wines he was familiar with, and when he settled in the Loire to work with Noella Morantin, there was a continuum in the philosophy, just that this time he was on the other side of the production line, working on the vineyard for Noella and taking care of the vines & grapes so that they could yield these real wines he loved. Learning the wine farm job the hard way, beginning with the vineyatd tasks (the organic way), he learned all the while the winemaking and tried his hand one day with a batch of grapes that Noella gave him so that he could make a barrel of wine. When Noella bought a few hectares of vineyards from Junko Arai recently, she transferred part of the vineyards that she rented from Clos Roche Blanche to Laurent, so that he could have his own rented parcels to make his wine. He keeps working all the while for Noella Morantin and uses his weekends to tend his own surface. This makes a pretty tight working week but many artisan wineries have started this way. When I showed up that day, Laurent and Noella helped by Juliette and Julien were busy bottling a vat of Gamay, and I was greeted like usual by Panache (pic on left, shot that day), an authentic Newyorker (actually born in 2007 in Connecticut) who seems to have become a successful transplant on the southern bank of the Cher river. This dog is very affectionate and loves also the outdoor, in short an excellent and silent companion for a winegrower. Driving to the vineyard Laurent left Noella and the two aides continue the bottling and we headed to his parcels with the vintage Citroën 2CV which is so convenient to drive on the grass roads. His vineyards are very close from the Tésnière wine farm (maybe 200 meters as a crow flies on the other side of woods) but you have to drive down the slope first and catch the next road along the slope further east, the one that goes up to Clos Roche Blanche, as these plots are among the large block of CRB vineyards on the plateau. This 2CV drive was a curiosity for me as I drive my own vintage Citroën (another model though) in the region when I'm around. To sum up Laurent's vineyard portfolio right now, he has 1 hectare of gamay and 70 ares of sauvignon since 2011 (rented to CRB), his first vintage being 2012. And this year (2014) he's taking over another parcel elsewhere near here in Pouillé, 50 ares of pineau d'aunis (aged 35 years) which he rents from Olivier Bellanger (Domaine de la Piffaudière), another new player in the area. I can't but notice how Laurent is lucky, as finding available Pineau D'Aunis to rent is a difficult thing. Laurent does all the farming there, and he harvests too of course. His first vintage with this Pineau D'Aunis will be 2014. Pruning the sauvignon We stop in the middle of the plateau, in an area circled by woods, his sauvignon parcel here makes 20 ares and it was planted in 1973. When Noëlla was using it, these grapes were going into the Chez-Charles cuvée. His own cuvée from this place is named Lucky You, and in 2013 he made 1500 bottles of it. The weather has been wet for days recently (England and Britanny are underwater) and the soil can't take more water. Growers have to wait before the ground can stand a tractor, so the grass is pretty wild, especially that except for november, there hasn't been cold weather until now this winter. The risk is that with this mild weather the sap gets back to the shoots and then a late-season frost occurs and harms the vine. In Laurent's parcel of gamay We walk just a bit further and here is the parcel of Gamay, which is about the same age as the sauvignon, these gamay have been planted in 1978. There's a one-hectare block, conveniently located along the wood (except maybe for the undesired shadow). These gamay make up Laurent's red cuvée La Pause, and they were part of La Boudenerie cuvée when Noëlla was managing the parcel. Laurent does the vineyard work on his parcels on weekends, in addition to the vineyard management he's doing for Noella, this make quite a busy schedule overall. These days, Noella has also hired Julien part-time to do some pruning. Panache seems wildly happy here, he runs who-knows-where, Laurent says that he's tracing scents of game, possibly roe deers which are many in the area. Good thing that the old Citroën is a cery casual car because its legs will be pretty muddy when we drive back. Moving After looking at Laurent Saillard's two parcels on the plateau, we got back into the Citroën with the dog, passing through the vineyard and then through the short stretch of woods along the slope going down to the flatland along the Cher river. We passed also the intriguingly-beautiful manor of Clos Roche Blanche overlooking the valley. Laurent told me that in the recent weekdays there was a team of the agriculture school of Amboise teaching young trainees how to use draft horses to pull out lumber from the steep slope, as Catherine is thinning out the trees along her slope. He says that it was so nice to watch these huge horses working with apparent ease. The door to the cellar Laurent rents this cellar since 2012, it is conveniently located along the road/main street at Pouillé, it is a typical cellar for the region, sitting right under the farm/house. This architectural design helps understand how life was like a century ago, people didn't have a cellar under the house storing the bottles that they had purchased here and there, they stored their own wine in barrels and they made their own wine from their own parcels, typically planted on the top of the slope a couple hundred meters away. The other typical family facility in the region is the cave/former-quarry type, like I reported about a year ago. The average vineyard surface per family was probably very small, 60 or 100 years ago, much of the wine was for the family use along the year, I guess people in the country side had little money to spend and made much of their food and beverage themselves. This cellar is a facility in itself with a press, an old pump and everything, it hadn't been in use as a facility for maybe 40 years, and all the period tools are still there. The removable wooden elements of the press are also there, stored vertically behind the main structure : the basket and the lid, as well as the couple of heavy beams that will weigh on the lid to press the batch (you can guess them above atop the cement structure in the background). You'd just have to change the wood staves of the basket and the lid, clean up a bit the metal or cast iron of the main structure, and here we go again for another century... A large barrel of gamay Laurent has me taste his wines, there are just a couple of cuvées at this stage, roughly a red and a white, but spread in different type of vessels. First, we taste the gamay from this big-capacity (500 liters) barrel, which was given to him by Thierry Puzelat and which was made in 2000. Half of the cuvée La Pause is in there. The gamay is still working, it's lightly fizzy, and there's the typical touch of the malolactic, but beyond that you have a very nice morello-cherry (griottes) aroma. Laurent says that year after year, it's the particularity of this terroir, even as we'll see later the morello cherry doesn't show up in other casks. He thinks that he will rack the wine later in february in order to bottle it in march. Speaking of the vinification, the grapes were destemmed this year, because the stems weren't ripe at all, following the tricky weather of 2013. This wine makes 11,3 % in alcohol only, it's a light wine, and he didn't want the stems to risk bring bad aromatics, so he took them off. the temperature being relatively cold when the grapes wrre picked, the fermentation took time to start, about 3 to 4 days (without outside temperature control, it was directly the result of the cold weather). He devatted relatively quickly, around 1050 instead of the usual 1000, because he didn't want to extract too much for this vintage. At 1050 he liked the peppery taste of the wine and he chose to devat right away, spliting the wine between the barrels and a resin vat. The alcoholic fermentation unfolded swiftly thereafter. Looking at three oblong barrels We're tasting now the same gamay from these three odd-shaped, 300-liter barrels, a bit longer maybe than regular casks. They were custom-made by Taransaud for Didier Dagueneau for their better interaction between the lees and the wine, but they also had a few more successive owners before Laurent got them, first at François Chidaine, then Marie Thibaut. Dagueneau used them on whites. The gamay has a different expression in these barrels, the malolactic is already over here, no more lactic aromas, but also the morello-cherry aroma is not noticeable, while the wine has a fruity character. No fizzy feel too, the wine is more on its way to aldulthood. Laurent says that when the barrels will be blended with the gamay in the fiber vat and with the 500-liter demi-muid, the morello-cherry side should remain because it has always been there in this particular parcel, it doesn't show up right now in these 3 casks but it will resurface later probably. It's a light, fruity wine, with the 11,3 % in alcohol it makes an easy drink, a, unpretentious thirt wine. Laurent doesn't plan to filter the wine. All this wine hasn't seen any SO2 yet and as for now, Laurent says that there's a good chance there will be none even at bottling. The cellar has some humidity here and there on the walls and on the ground but it's quite good when you have casks, it allows you to "spend" less wine for topping-ups, the atmosphere being more saturated. The vat pictured on left is the sauvignon Lucky You, on which Laurent checks the air-tight lid, this sauvignon will be bottled in march. Two barrels of Sauvignon When Laurent made his first white in 2012 (a sauvignon), he made only one cask of it, but alas the barrel marked too much the wine, plus he had picked a bit late, so it was more a gastronomy wine, you had to eat with it because it was thus more heavy. On the other hand, for the sauvignon 2013, part of which being in a vat and the other part being these two barrels, he'll not blend the two parts, because the part in the vat is ready, it tastes fine, it will make some sort of spring cuvée soon to be bottled, with a neat, simple sauvignon making only 12 % in alcohol. These two casks on the picture will go through a longer élevage and he will probably bottle this sauvignon in september. Looking at the chalk-written data on the top of the barrels, they're at 1010, still high in sugar, and Laurent noticed that the fermentation goes on very slowly, which should yield very good results. Unlike under cold winters, the cellar while cold was not cold enough to have the fermentation stumble, so we have here an uninterrupted slow fermentation, something that yields interesting aromas. These sauvignon grapes had a potential of 12 ° when picked. There was a lot of sorting, you may have seen in the video above when Laurent stops along a vineyard with lots of grapes still hanging, this is the parcel and he only picked the healthy grapes, leaving the rest behind. Laurent cooking Driving back to La Tésnière, Laurent went to the kitchen to prepare the lunch for our small party : Noëlla, Juliette, Julien, himself and me. I love this job, especially that I know a little about the history of this meat in the frying pan, I shot pictures and a video of "Mister Pig" like Noëlla and Laurent nicknamed this cute little pig the became very big over a few months. Imay have written somewhere that Laurent made the trip from the restaurant side to the production site, with the winemaking, but he also makes his meat, terrines, saucisses, hams, blood sausage and everything, in short he manages to control all the food/wine process and when you happen to eat there it's a treat. At home in mud It's been a few years now that Laurent has been raising a pig in the backyard (a different one every year, usually from march to december if I'm right), he buys a very young piglet and feeds it a few months, it's barely believable how little time it takes to make a large pig out of such a small piglet. I shot the video above last october, the cute pig was still a couple months away from its turning into hams and other delicacies. I was supposed to be there on the fateful day but couldn't because of my job and next time I visited the poor pig was gone. But I'll manage to be there next time... Laurent, when he's not working in the vineyard Laurent ¨feeds it foremost with whey which he sources in a farm in Monthou sur Bièvre, the Ferme de la Guilbardière, it's an organic farm and he met the owners when he worked at L'Herbe Rouge (the restaurant managed by Thierry Puzelat's wife) in the summer of 2008, when he left New York for France. The whey was about half of the pig's feed, no less, then they were regularly given leftovers from the organic bakery in Pouillé, and they also fed it with peelings, kitchen leftovers ans the sort. He also fed it with organic grains sourced from Pascal Cazin, a farmer raising organic poultry and lamb near Cheverny not far from here. He also picked tons of chestnuts and acorns in the region (chestnut trees abound in the woods in this region) and also recovered apples and other fruits that lay unpicked in many orchards, his neighbor brought him boxes off apples and quinces for the pig, apples that were very acidic , from a variety being cultivated in the past for alcohol making. You can notice on the video that this pig sort of speaks, with a peculiar sort of language, but still, it looks much like speaking. Another subject of meditation is how these animals can turn any place in a muddy mess, if you need to overturn a piece of land, don't bother to bring in a tractor, just take a pig for a week, he'll do the job. Just make sure to fence the lot or he'll trash you property. When the right time came, "Mister Pig"'s last day came and the winery forklift was rediscovered through an unusual __but convenient__ use, as these animals weigh tons, almost literally. In the days folowing that fateful day, Laurent prepared all these hams and diverse pork preparations, putting much of them in the freezer and taking them out for special occasions like today. This cycle is exactly what farmers would do in the past to have meat products through the winter. The picture on the sides were shot by (or with the camera of) Corinne Gillet, who with her husband Paul (both pictured on right with Laurent and Juliette) are the new owners of Les Maisons Brûlées. Noëlla, Laurent, Julien, Juliette... Speaking of labels, his first sauvignon didn't get any, he just wrote the name of the cuvée on the bottle, Lucky You. There had been only one cask of wine and I guess it wasn't worth minding with a label. He just printed a small back label with the basic informations : Vin de France, 14 % Laurent Saillard, vigneron à Pouillé. He sols this cuvée at Le fruit Défendu in Poitiers (a caviste/wine bar), and in Le Vin Vivant in Nantes, a caviste/bistrot. Wholesale price was 7 € for this cuvée. He has several ideas for the 2013 label, he's going to decide soon, I don't think I betray a secret by saying it should be close to the design of the bottle on the right (in the picture on the right). This sauvignon cuvée should make a volume of 1500 bottles. The wine will be found at around $ 25 in New York. Laurent has an importer there bringing the wine in and take care of the customs paperwork, but he's in charge himself of distributing the wine, which spares the cost of an intermediary. He knows people in New York after having worked for years in the restaurant scene and there are a few cavistes and restaurant where his wine will be available, like Reynard (Wythe Hotel), probably at Marlow & Sons, Thirst Wine Merchants, Passage de la Fleur (Fifi), Ten Bells (Fifi again), Vinegar Hill, then possibly Maison Première, also Uva, a wine shop in Williamsburg-Brooklyn. Otherwise his wines shouls also sell in Japan through Vinscoeur, in the Netherlands through Vleck, in Switzerland through le Passeur de Vin, in Norway through In Vinum, and in Paris through Caves Augé plus a few restaurants and cavistes there. The label for the Gamay (la Pause) is very bare and simple, with again the words in typewriter fonts reading Vin de France - 12 % vol - 75 cl -LG13 - Mis en bouteille par LAURENT SAILLARD vigneron à Pouillé 41 - Produit de France - Gamay - Contains sulfites plus a miniature logo to warn pregnant women. 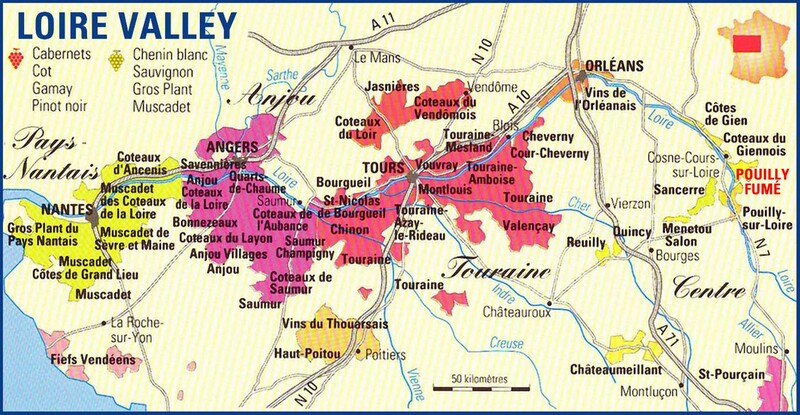 The gamay will cost 7 € wholesale, with a 15 € retail price in the wineshops in France. Laurent pours his wines only in one wine fair, La Dive (which took place early february in Saumur, near Angers). Considering the low volumes he has, this is enough, and he had fruitful contacts in La Dive, as well as orders. Plus, he visits this wine fair since 12 or 13 years, he used to go there when he was living in New York, visiting as a wine buyer for his restaurant. Now that he is on the other side of the trade, he likes the fact to take part on the source side. Saucisse aux algues If you want to upstet Laurent, just say casually "why don't you just open a restaurant on the side to serve all these beautiful things that you have prepared yourself"... Of course, he's a grower first of all and it takes so much time to tend a vineyard that it leaves little time to run a restaurant or cook professionally. But we can thank him for being among the lucky few (well not really few after all) whom he grants with his culinary savoir-faire. This seaweed saucisse is one of his home-made products, he mixes the pork meat with the seaweed sourced in Britanny, the inside of this sausage is full of tiny pieces of dry seaweed, which gives a particular taste to the dish. As for the meat part, there is some ham, chest, pork fat, pepper & salt, apart from the crushed seaweed. Laurent says that they only eat meat when they've visitors, otherwise the rest of the time they eat vegetables. We actually began with a terrine (no picture), just delicious... Laurent says that he never made terrine before living here, his first tries were in 2008. He also made dishes with game, which is easy to find in the region, and Noëlla gets regularly pheasants from her father who hunts on the coast, this all widens his experience in preparing meat products. We also had a soup designed by Laurent and made from persil tubéreux (rooted parsley), something which in my impression carries both the properties of parsley and celery.